Question: If spiritual attainment is individual, then how can the results of the connection with others affect the fact that I do not need to again go through whatever I have been through in the past? Since Kabbalah was closed off, hidden from millions of people over 2,000 years, we now need to revive it and start spreading it. We are thus trailblazers, pioneers in its dissemination. The question is, have there been any corrections made in the past, which we do not need to pass through again? It can be said that on the inanimate, vegetative, and animate levels, corrections of the soul are practically finished. The last level, however, must still be corrected. What is the purpose of the global crisis that creates not only economic problems, but also mental problems? It is possible to stop this if we know the process of development and its purpose, what forces are acting on us. The network of mutual responsibility will solve these problems. We are all partners building a template for a new human society. This new network of mutual responsibility will open up a new type of profit that even money cannot buy. People will feel the lives of others more and will experience an internal sense of freedom, expansion, relaxation, harmony, quiet, and comfort. The beautiful relationships between people will stabilize the integral power and serve as an example for the whole world. Question: Does fear help self-understanding? Answer: Fear is a very much needed form of inner existence because egoism, which is the desire to enjoy, feels only emptiness or fulfillment, that is, fear or liberation. Thus, fear is the most natural form of egoistic existence. In our world, there are over 800 kinds of fear. Through these kinds of fear, we study ourselves. 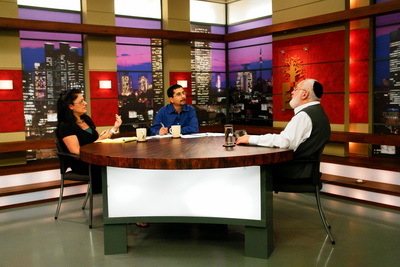 Question: Is there a method to rise above fear in Kabbalah? Answer: Of course! What’s most important is to build the greatness of the Creator within, which will help you rise above fear. Fear will constantly pressure and help you in the left line, and you will rise above it in the right line. It advances you. In other words, the ascent above egoism is an ascent above fear. In every moment in life, a person feels afraid even without realizing it. That is, feeling yourself is the realization of fear: “What is going on with me? What internal and external problems do I now have to hide, isolate, and save myself from?” Everything is balanced only on the awareness of fear. Question: How can one balance this uncomfortable state? Answer: It can be done only by rising above yourself: restriction (Tzimtzum)—screen (Masach)—reflected Light (Ohr Hozer). Question: Today, humanity makes a lot of money on antidepressants that help us get rid of fears. Does it mean that fear constantly grows over time? Answer: Humanity is now going through a very interesting period of mutual inclusion into each other with the help of virtual networks and so on. This will continue growing. A person will have many problems, fears, and anxieties, because by becoming included into each other through this mechanism, each one brings his fear to others. By doing so, we correct many things in each other. How To Get Rid Of Fears In Life?